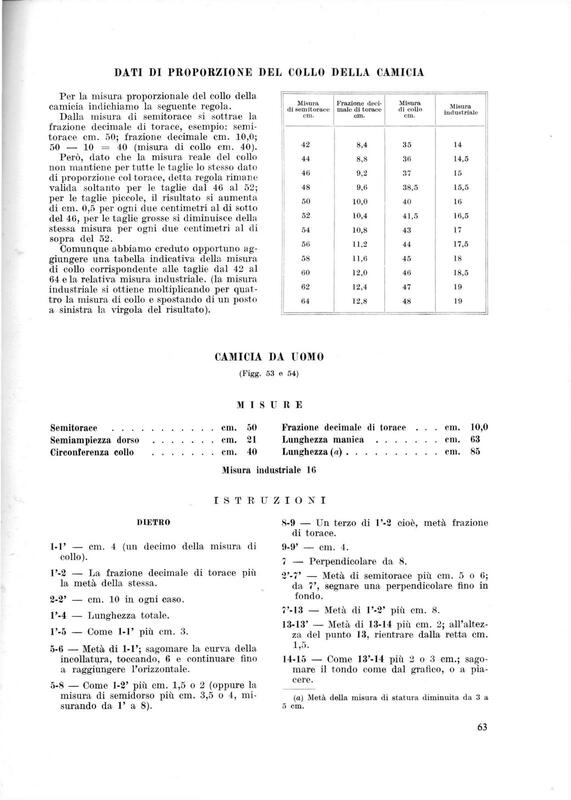 Thank you Schneidergott for those pages and in particular for the formula, because working with the books from 'La modellistica dell'abbigliamento' it is much easier to hand my pupils the formula instead to tell them to learn the tabel with the 'scollo' measurements by heart. Many thanks Schneidergott, what a treat. How is it going in Scotland? Must be quite eventful lately. Are you referring to the independence vote? Yeah, they got close, but not more. The Westminster politicians made a lot of promises which soon will be forgotten. Either way, I'm glad all the commentary on the radio is gone. I am actually quite surprised what a lovely summer we had here in the South-West. From the tales so often told I expected worse... But then, we are in the Lowlands. I'm sure higher up it's getting a bit fresher already. Interests:Modest clothes with correct fit, and a cure for brain cancer. I'm still working on a 1959 Rundschau toile for my husband, but this one might be next. If most women are not 5 feet 10 inches 120 pounds, why do these unrealistic models dominate the runways? Giving a quick look at the draft, I notice distance between 2' and 7' (on the back) is 1/4 of the chest plus 5 or 6 cm. I am making shirts now in Italy, and I give 1/4 of the chest plus 3, and often customers thinks is too much. Which is the opinion of shirtmakers here in the forum ? I noticed the same here in Australia. No ease to speak of and even extra darts indietro to 1 cm. No body cares for comfort in motion. SORRY !!!! I relize I did a mistake......I give 3 cm ..... but then another 1 for the seam ! This is a shirt draft from the 60's. There was an ease about 10 cm (half pattern) right for a normal shirt. If you do less - you can not use the sleeve draft in my opinion. A shirt with 6 cm is today a slim shirt. Just made some shirts for me with 5,5 cm ease on the half. I feel that it would be hard to make slimmer shirts without using stretch fabric unless you want to wear something uncomfortable. Edited by gramountoto, 26 September 2014 - 04:46 AM. I'D say the amount of ease depends on personal taste/ preference and the figure. An overall ease of 12 to 16 cm is fine, much more or less and it becomes uncomfortable or too wide to be worn under a jacket. This is a basic draft and you need to play with all the different points of construction. Since they only use 1/4 chest plus ease you have to decrease the shoulder width a bit as well if you use less ease in the chest. Otherwise you'd end up with a very small/ narrow armhole. In some cases the sequence in the draft instruction is not logical. I wish to know how the change of the shoulder length might affect the wearing of the shirt. I have been working at the Rundschau draft for a model and when he wanted even less ease than was allowed for in the basic draft I noticed that the shoulder length was reduced. I have not had a chance to fit him yet but I wonder what to expect from such a change? It seems an important element. eg the sleeve will become too short, or the neck seam might be affected. How will a narrow armhole affect things? Edited by Schneiderfrei, 26 September 2014 - 02:08 PM. In some cases they tell you to measure from the neck (over the shoulder) to the wrist. So that would be the total measure you will have to have in your draft/ shirt (plus ease/ additional length like 2/3 of the cuff height when you subtract it). To keep that measure the same you will have to adjust either the shoulder width or the sleeve length, depending on which one you change (for example: wider shoulder = shorter sleeve/ crown). A narrow armhole wiil have to be very close to the body (high), otherwise you won't be able to move with comfort, given that the sleeve is wide enough for the arm. So make sure that each section stays in a relative proprtion to each other. So don't cut wide fronts and backs and make the armhole deep and narrow (or the other way round). And the closer fitting a shirt (or any garment for that matter) has to be, it will need more back balance. In the Ciraci Shirt, above, it looks like the sleeve is measured from the end of the shoulder seam, unless the arms are very short. Can you say how they do it? 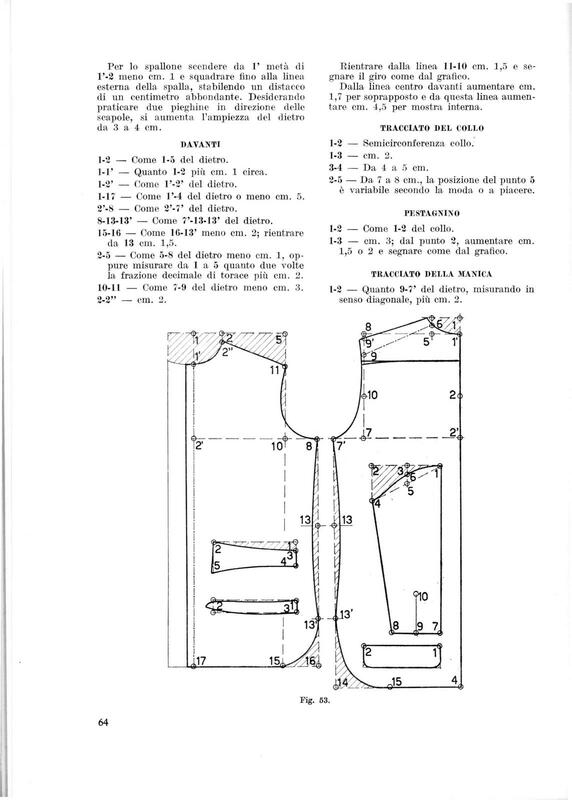 One more thing, please, I don't understand the significance of the semiampiezza dorso measurement or how it is calculated? 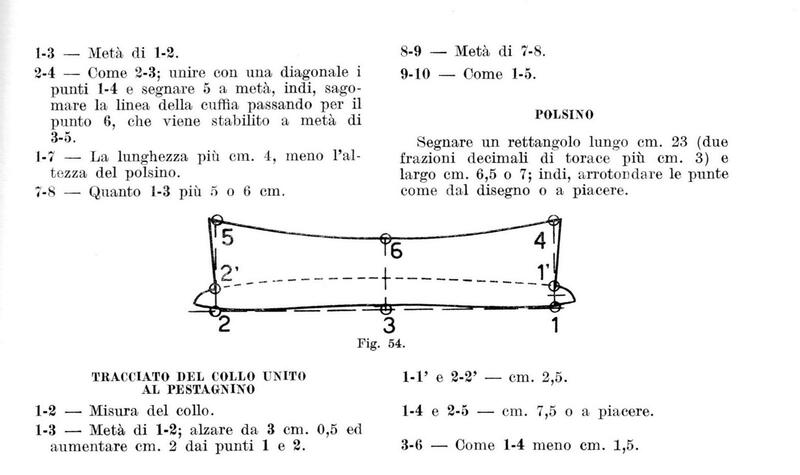 Is it the measurement that is mentioned in the 5 - 8 as semidorso? It is brilliant to see this draft, it makes it very clear why the Rundschau is so well thought of. Edited by Schneiderfrei, 27 September 2014 - 02:24 AM. Hi Gatto and folks. In Naples is also 1/4 of chest plus 3 and i try to do even less when possible. Default is plus 4 cm. What is your max waist -? -1'5 cm and tge back dart of max 3 or have done more than it, that was the teoric limit i was told but i always try to be over? I have no idea where they get the semidorso (half back) measurement from. I couldn't find a chart or a formula for this. I checked the coat drafts and even there the half back varied although the chest width was the same. But it seems (though I am totally guessing here) that they add or subtract 1/4 of each size they go up or down. In a coat draft for half chest 48 the half back measured 20,5 cm. So for half chest 52 it would have to be 21,5 cm half back width. In either case, this half back is measured from 1' to 8 or from 2' to 7. Thank you Schneidergott!! I refrain from other comment (either about my own stupidity or that of the draft). Except, could this be a direct measurement?? Edited by Schneiderfrei, 28 September 2014 - 10:35 AM.